I guess you're thinking that what I'm goin' to talk about right now is some historic raid in WWII or some Operation Desert Storm-like raid, yes? No? Yes? No. Whatever. Most of us (especially those who write at night) have this calling, like a religious one, that is so hard to resist; the calling of the fridge. This has a lot of causes, either you're stressed, bored, or it could be a habit that you just failed to look at. Whatever it is, there's only one result; gaining more weight. I'm not saying that the time of your attack on the fridge is the main reason to weight gain, but the type of food you tend to eat during these wee hours. Some of the top-listers here are chocolate, chips, ice cream, desserts, you know, the heavy weights. Even though our body's food processing doesn't differ from daytime to nighttime, it's after dark that our body's calorie need is minimal. The result, additional pounds. So, how will you stop this? Here are some tips gathered from different sources. Resolve not to eat after dinner. Increase your fiber diet. Try adding some beans to keep you feeling full. Distract yourself. Take a walk or relax in a warm bath. During dinner, eat slowly. Take time to savor the food. If you can't hold it, satisfy your cravings with a cup of tea, sticks of carrot, or a fruit. ALWAYS eat while sitting down at the table. This could break the habit of munching in front of the TV. Start your day with a proper breakfast. Midnight raids ain't that hard to overcome, as long as you eat on a regular meal routine. Just keep it simple, and remember that getting into the habit of NOT eating after dinner is how you'll win the war. Posted in bad habit, dinner, Eating, Health, late night habit, Lifestyle . Bookmark the permalink. RSS feed for this post. yay! oreos! hala ka jan, wasak ang diet. If the fridge is talking to you then there's a problem ahaha! I remembered the film "Requiem for a Dream" where the fridge calls out to the woman haha! I'm also conscious of what I eat since I gained a few pounds. Hey, I remember that! Haha. nyaahhah.exactly! we have the same thoughts..hahaha..kaso, i can resist naman..for a decade now..yay!! and am proud of it..nung mga high school p lng, di talaga..kain talaga..hahaha..
My husband is on diet I stop buying those food that we normally have like different types of cheese and biscuits, dessert, ice cream, chocolates and drinks like wines and beer. I replace them with healthy options. Vegetables, fruit and juice not from concentrate and water. So when he look at the fridge he force to eat a celery and grapes with no cheese and wine. Simple disciplinary actions. Diet na more saving pa! We drink wine and beer and have some dessert once or twice a week na lang. Hindi na pwede gawing daily kasi ma-sira ang diet. I am not fond of sweets and junk food so i don't mind midnight ride coz I don't eat that much .I grab me a bowl ,put a cup of rice and what ever left over food in the fridge plus a cup of tea or coffee .Everyday is a diet day for me .Unlike others ,I wish to gain more weight. Midnight raid, as you've mention, has several reasons why some people are doing this. And you've anticipated on what to do. Your things-to-do away with and things-to-do take a bit of discipline. Everything with a purpose is worth doing. Thanks for these tips. They're worthwhile or worth complying with. I am an online freelancer and I work as a website developer, and I usually work at night. I am guilty of this and I don't have any plans on staying away from the fridge hahaha. wow..you surprised me again Paliits! pure English ang post. ah, i know why? it is difficult to find a Tagalog translation for fridge haha.well seriously I'm guilty as charged about eating after midnight!but i actually don't raid the fridge for a little variation. i eat all my emergency stuff - vienna sausage, chocolates, orange sticks, pork and beans, pringles, or whatever is easy to open since i am in my room at midnight and fridge is downstairs and i'm freaking scared of going down alone! good thing i have my 72 hour kit! I once put a weighing scale in front of the fridge but it didn't help. 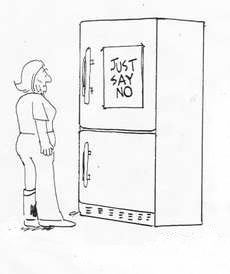 The perfect solution is not to food anything ready-to-eat inside the fridge. hahaha.